Bram Stoker’s The Man (1905) has received little attention from readers or literary scholars. However, it is actually a very fascinating work that shows how enmeshed Stoker was in Victorian literary traditions. It also reflects the possibility that he was trying to work out his own feelings about women, or possibly himself as a homosexual man. Some critics have considered the novel sexist, but to some degree, it more likely is subversive, a typical method used by the Gothic to push against society’s boundaries, while ending conservatively to be acceptable to the general reading public. And while not a Gothic novel in itself, The Man draws on many Gothic elements. A cover for a recent edition of The Man – the image fails to portray the novel’s theme and misrepresents the novel. The Man, to some degree, might be seen as a revision of a minor scene in Dracula and its results, and the question of its sexism revolves around this revision. In Dracula, Lucy suggests that a woman might propose to a man—critics like David J. Skal in Something in the Blood: The Untold Story of Bram Stoker, argue that Stoker punishes Lucy for this belief with living death when she becomes a vampiress. In The Man, the main female also makes this proposition, but to understand why she suggests it and how Stoker treats her for it, first we need a little background on the novel’s characters. The primary female character in The Man is Stephen Norman. She is the daughter of a squire who always wanted a son to succeed him, but his wife dies giving birth to their one child, a girl, whom he promises he will love as much as if she were his son. As a result, he raises up Stephen like a boy, giving her a male name and raising her to run the estate. Note that Stephen also has no mother to soften her nature, although she has an aunt who comes to live with them. The novel begins with a prologue where Stephen and Harold are in a churchyard together. Harold is the son of Stephen’s father’s friend, a minister. They are sitting on tombstones and arguing about whether women can be just. Stephen wants to attend court sessions so she is prepared to be just in her role when she is the master of the estate. Harold and Stephen have grown up together and are like brother and sister. When Harold’s parents die, he comes to live with Stephen and her father. At one point, the two of them go to explore a crypt and she wants to enter it, but he tells her not to because he knows her mother is in it and he fears it will upset her. Later, she returns and enters the crypt, which causes her to faint. Harold finds her and carries her out, but Stephen is under the impression a neighbor boy, Leonard Everard, carried her out. Harold does not correct her misbelief, and consequently, Stephen begins to think she can admire and possibly love Leonard. Soon after, Stephen’s father is in an accident and dies. On his deathbed, he asks Harold always to look after Stephen and love her and stand by her if she loves another. Harold agrees to all this, not yet realizing Stephen loves Leonard, and by now, Harold loves Stephen. Meanwhile, Stephen wants to go to the court sessions. Her aunt tells her that some things women should not know and refers to the tree of knowledge. This is the Gothic theme of forbidden knowledge, and a reference to Eve’s transgression in eating the forbidden true of the tree of knowledge. Stoker here seems to suggest that women who step out of their traditional roles are committing transgressions. The aunt goes on to discuss fallen women, but Stephen says that if women sin in these cases, so do men. Stephen then goes on to tell her aunt that women have just as much right as men to propose when they are in love. Stoker is setting Stephen up for disaster here. She believes women are the equals of men, and now that she has feelings for Leonard, she decides she will propose to him to put her theory into practice. The narrator then tells us her preparations were like those of the devil when tempting Jesus. Like the devil who takes Jesus to a cliff, Stephen asks Leonard to meet her on a hill where he can see all her property and then realize the wealth he would have should he marry her. Stephen, like Satan, is tempting another with riches and power. Leonard, however, is shocked by Stephen’s proposal. He finds it abnormal for a woman to propose and quickly refuses her. Stephen then asks him to forget about it. However, Leonard has debts and Stephen is rich, so he begins to reconsider. Soon after, he gets drunk and brags in a tavern to Harold that he is going to marry Stephen. Angered, Harold goes to Stephen and proposes to her before Leonard can get to her. She, however, comes to realize he knows about her proposal to Leonard and that Leonard said no. She suspects Harold pities her or that he thinks she’ll say yes to any man, so she refuses him and tells him she never wants to see him again. Harold then decides to leave England. Leonard now tries to get Stephen to marry him, but she refuses, although she agrees to pay off his debts. I cannot help being reminded in these scenes of Mrs. Radcliffe’s The Mysteries of Udolpho (1794), in which Emily St. Aubert falls for Valancourt, whom she thinks is perfect, yet we later find out he has made a mess of his life through gambling and getting into debt. Leonard has turned out to be far from Stephen’s equal and she now has a hard time getting rid of him. Meanwhile, Harold is heartbroken. On the journey to America, he feels tormented. Then a little girl, Pearl, is washed off the ship and he jumps into the sea to rescue her. After that, the little girl is besotted with him and begins referring to him as “The Man.” Her grateful father, Mr. Stonehouse, realizes Harold is tormented and befriends him, suggesting that if Harold is a criminal, he will help him, even offering to adopt him as his son. Harold assures Mr. Stonehouse he is not a criminal, but the idea of changing his identity appeals to him. Eventually, Harold ends up in Alaska. The author makes it clear he is in the wilderness—this is a time of wandering and being lost, like the Israelites before they entered the Promised Land. Harold is undergoing the dark night of his soul and being much the Gothic Wanderer in his torment. However, he ends up becoming wealthy in the mines and adopts for himself the name Robinson, taken from the mine. He now decides to return to England after an absence of a few years. Meanwhile, Stephen has inherited a castle from a distant relative and become a countess. She also longs for Harold, gradually realizing she wronged him. In her new home, she is gracious and kind to everyone, seeking to redeem herself. She also meets Sister Ruth, a Quaker woman, who dresses in white and gray, causing her be known as the Silver Lady. To Ruth, Stephen confesses she once killed a man—not physically, but she says she killed his soul. It’s important to note also that Stephen decides to be incognito when she meets Sister Ruth, not telling her at first that she’s the countess. She prefers, like Haroun al-Rashid, we are told, to visit incognito those socially beneath her. Ironically, Harold’s ship now sinks off the shore of England near the castle Stephen inherited. Stephen sees a man (she doesn’t know it’s Harold) valiantly trying to save lives. Eventually, he swims toward shore, and she has a fire lit (by actually setting a house on fire) to warn him of the rocks that he will be dashed upon. At one point, he looks up at her, dressed all in scarlet, and recognizes her before he is rescued. However, during the rescue efforts, he also goes blind. (One wonders whether the sight of Stephen caused his blindness and whether Stoker is implying she’s a scarlet woman.) At the same time, Stephen is far from a scarlet woman—rather she is praying to God for Harold’s rescue, feeling guilt over how she hurt Harold and asking God to let her atone for the man whose soul she killed by letting her save this man, never suspecting the two men are the same. At times, she thinks how she wishes she had the power of God to rescue, which sounds like pride and a longing to be like God (Satan’s crime), but instead, God hears her prayer and allows Harold to be saved. Harold is brought to the castle to be cared for. Because he has a beard and his eyes are bandaged, Stephen does not recognize him. Harold, however, realizes Stephen is there and he does not want her to pity him so he tries to get away. When Harold questions the doctor about how high up in the castle he is, the doctor thinks he plans to commit suicide by jumping out the window as a way to end his misery over being blind. Harold then confesses to the doctor that he loves Stephen but wishes to keep his identity secret from her, which is why he wishes to escape. The doctor agrees to keep Harold’s secret and tells Stephen that Mr. Robinson doesn’t like visitors. The doctor doesn’t want Harold to leave because he hopes to cure him of his blindness. I can’t help being reminded of Jane Eyre here, where Mr. Rochester is blind and weakened when the now wealthy Jane Eyre finds him. Stoker has put his male hero in an equally weakened state, even though Harold’s bravery has caused him to be referred to as a “giant” more than once in the novel. Bram Stoker, who was over six feet tall, and might be considered a giant and “a man” in his own right, seemed to prefer being submissive to other males. These scenes of Harold, his identity unknown, living in Stephen’s house, also remind me of Ellen Wood’s East Lynne (1861), where the adulterous wife returns in disguise as a governess to care for her children, only in this case, it is the future husband, not the wife who is in disguise. Since the wife in East Lynne was adulterous, here we can almost think Stephen was adulterous in propositioning Leonard when Stephen, at least in Harold’s heart, already belonged to Harold. Perhaps a stretch, and Stoker isn’t drawing straight analogies, but the influence seems likely to East Lynne or similar hidden identity cases in Victorian fiction, which are countless. Of course, Stephen will eventually learn the truth about the blind man’s identity. It comes about when the Stonehouses, hearing of Harold’s bravery when the ship sank, come to visit Stephen, suspecting he is “The Man.” As they tell Stephen about their previous meeting with Mr. Robinson, Stephen realizes that “The Man,” “Mr. Robinson,” and Harold are all one. Eventually, she takes the Stonehouses to him. Once he removes his bandage, all is revealed except the love beating in Stephen and Harold’s hearts. At this point, Pearl tells Stephen that she always wanted to marry “The Man,” but that Stephen should actually do it because while he saved her, Stephen saved him when she lit the fire to rescue him. The end of the novel may be considered very sexist. We are told that now Stephen knows her “Master” and that when she knows Harold loves her and will come to her, “She was all woman now; all-patient, and all-submissive. She waited the man; and the man was coming.” Of course, submissiveness seems sexist to modern readers, but it was conservative for Stoker’s time, perhaps overly conservative in an age when women had become fighting for their rights. I am left thinking we can read this novel in various ways. First, as Stoker’s concern that women were getting too much power and stepping out of their bounds, or second, we can read it as his being supportive of women and showing the difficult situations they are in, showing us how Stephen is rejected by her society for her mannish ways and so, ultimately, she has no choice but to submit to a man. And while the novel’s title refers to Harold, it isn’t until nearly two-thirds of the way into the novel when Pearl starts referring to Harold as “The Man” that we even know who the title refers to. Given that Stephen acts like a man and has a man’s name, one might think she is “The Man” for the first part of the novel. So is Stoker being subversive, or sexist and conservative? There are no easy answers to these questions. I think much more analysis needs to be done on The Man. It is definitely a fascinating novel of identity issues, gender issues, and Gothic themes that is firmly enmeshed in a Victorian literary tradition. Tyler R. Tichelaar, PhD, is the author of The Gothic Wanderer: From Transgression to Redemption, a study of nineteenth-century British Gothic literature from 1794 (The Mysteries of Udolpho) to 1897 (Dracula) with a look at twenty and twenty-first century texts like Tarzan of the Apes, Anne Rice’s vampire novels, and Stephenie Meyer’s Twilight series. Tyler has also written Haunted Marquette, a history of hauntings in his native city of Marquette, Michigan, Spirit of the North: A Paranormal Romance, and the historical fantasy series The Children of Arthur, which details the story of King Arthur and his descendants, beginning with Arthur’s Legacy and including Lilith’s Love, which is largely a sequel to Dracula. You can learn more about Tyler at www.GothicWanderer.com, www.ChildrenofArthur.com, and www.MarquetteFiction.com. Charles Brockden Brown is often cited as America’s first Gothic novelist, but frequently, James Fenimore Cooper and Nathaniel Hawthorne are credited with taking the Gothic out of European castles and placing it in the American forest. The truth is that Brown deserves that credit as well in his finest Gothic novel, Edgar Huntly, or, Memoirs of a Sleepwalker, published in 1799. I recently read Edgar Huntly for the first time and was surprised to find that I thought it was the best of Brown’s novels. I had read Ormond years ago and found it very dull, but being a fan of the Gothic and literary history, I went on to read Arthur Mervyn, which had some fabulously suspenseful scenes, and Wieland, which is known for its use of ventriloquism, though I found it a bit slow. But I think Brown truly wrote his masterpiece in Edgar Huntly for several reasons, most importantly, that it maintains the level of suspense throughout. 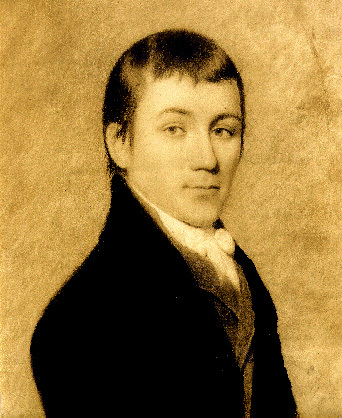 Charles Brockden Brown (1771-1810) wrote all seven of his novels in the short period of 1798-1801. I won’t give a full plot outline, but just hit on a few high points. The novel begins with the title character grieving the death of his friend Waldegrave, who was murdered, but the murderer remains unknown. Brown uses the manuscript technique, in this case in the form of a letter, to have Huntly describe the events of the novel to Waldegrave’s sister, Mary, who is also Huntly’s love interest. A collection of papers belonging to Waldegrave is also in Huntly’s possession, which eventually go missing, hence more manuscript usages. Huntly soon observes a servant who lives nearby, Clithero, sleepwalking and digging in the ground to hide something, making him suspect Clithero is Waldegrave’s murderer and sleepwalking due to a guilty conscience. Huntly learns from Clithero’s fellow servant and bedfellow that he has overheard Clithero uttering guilt-ridden speeches in his sleep. Finally, Huntly confronts Clithero and from him hears his full story of despair and guilt and crime and how he fled Ireland to come to America. The story is part of the stories within stories Gothic technique and provides plenty of Gothic themes, including social mobility that suggests transgression, gambling, and illegitimate children, not all Clithero’s crimes but those of his mistress’ brother, whom he eventually kills, thus staining his hands with blood. I’ll leave all the details for interested readers to discover, but it turns out Clithero is not the murderer of Waldegrave. What Clithero is, however, is a Gothic Wanderer figure, one who believes he has also killed his mistress, and who feels incredible guilt and is in exile for it. Huntly refers to Clithero as a “wanderer” and Brown does an amazing thing in showing Huntly willing to forgive Clithero when he still thinks him Waldegrave’s murderer, saying he will befriend and help heal him once he hears his confession. 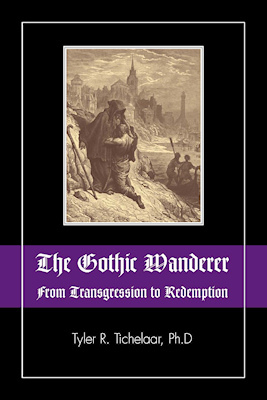 This desire to redeem the Gothic wanderer is rare in early Gothic works and more of a Victorian theme. Whether or not Clithero is worthy of redemption will be seen at the novel’s end. After telling Huntly his story, Clithero flees into the woods in despair. Huntly searches for him and finds him perched high up on a rock but Huntly cannot reach the summit and returns home. Soon after, Huntly finds himself in a strange cave and believes himself to have been abducted. The novel’s suspense really skyrockets at this point as Huntly makes his way out of the cave and has to get past savages as well as rescue a white girl who is their captive. From that point, Huntly goes through a series of adventures in the forest that result in some truly suspenseful scenes as he constantly fears death at the Indians’ hands. The novel, of course, is racist in its attitude toward Native Americans, but that doesn’t eliminate the very real fear that a white man would have felt in this situation, and it does make the forest truly Gothic in atmosphere. I’ll leave it up to readers to discover how the plot turns out and who murdered Waldegrave. There are several twists and turns, though Huntly’s time in the forest fleeing from the Indians takes up a good half of the novel, and at times, I thought perhaps Brown had almost forgotten about the plot concerning Clithero and Waldegrave, but they are brought back in the end and all explanations made. The book is not perfect, but it is probably the best Gothic work before Poe and Hawthorne. (I don’t think Cooper, despite the suspense of his stories, really qualifies as Gothic since he doesn’t rely on typical Gothic themes like manuscripts, the supernatural, transgression, etc.) Brown writes more realistic Gothic fiction, not using the supernatural, but all the other elements are present in his work. The novel’s faults include the sleepwalking—both Clithero and Huntly turn out to be sleepwalkers, which seems unbelievable to me; I have yet to know anyone who actually sleepwalks in my life. The other fault that makes Brown tiresome at times is the sheer wordiness of his writing. He continually repeats himself and lets Huntly think through the same matters multiple times. One phrase that I found completely laughable was when Huntly said, “by a common apparatus, that lay beside my bed, I could instantly produce a light. The light was produced.” Why couldn’t Huntly have just said, “I lit a candle”? Despite these faults, there is suspense up to the last moment, even when the wordiness gets in the way. Anyone who loves Gothic fiction and loves Poe and Hawthorne would find Edgar Huntly the best novel to read as an introduction to Charles Brockden Brown. The American Gothic tradition owes a huge debt to him. The Wandering Jew was originally a symbol of the Jewish people who were themselves wanderers and outcasts among the world’s settled nations. In 70 A.D., the Jews rebelled against Rome, only to have their rebellion defeated. The Romans punished the Jews by dispersing them from their homeland and selling thousands of them into slavery. This dispersion resulted in the Jewish people migrating all over the known world and becoming residents in every European country. Because Christians blamed the Jews for the crucifixion of Christ, wherever the Jewish people settled, they were mistreated and often forbidden to reside in certain countries. Consequently, even when they settled somewhere, prejudice against them would frequently result in their migration elsewhere after a short time; the Jewish people were continually forced to wander about Europe seeking a place where they could live unmolested. During the Middle Ages, one of the harshest penalties frequently imposed upon the Jewish people was a prohibition against their owning property, which added to their wandering status and inability to remain in one place for extended periods. Because they needed a source of income that they could not achieve by living off the land, many Jews took advantage of Christianity’s prohibition to its followers of being usurers. The Jewish people filled the needed position of moneylenders, and they frequently became wealthy as a result. Consequently, the Jewish people had two primary stereotypes attached to them: they were wanderers, and they were greedy people who were constantly grasping for money. Europeans who were jealous of the Jews’ wealth spread fabulous derogatory tales about them: Jews possessed hidden and heavily guarded treasures; Jews possessed the evil eye by which they could curse and destroy people; Jews had horns or tales, and they emitted foul odors of brimstone and sulphur which suggested their alliance with Satan because they were responsible for Christ’s crucifixion. Jews were even accused of draining blood from Christians to use for sorcery practices (Zatlin 135n). Particularly in times of social upheaval or economic crisis, such stories were circulated to encourage anti-Semitism and to validate removal of Jews by forced emigration or even extermination. From all this anti-Semitism arose the medieval legend of the Wandering Jew. In most versions of the legend, the Wandering Jew was a shoemaker named Ahasuerus who refused to allow Christ to rest on His way to the cross. Christ punished Ahasuerus by forcing him to wander the earth without death or any form of rest until Christ’s return on the final Judgment Day. Usually, this cursed condition is interpreted to mean that Christ will eventually redeem Ahasuerus who will have atoned for his sins by his prolonged wandering (Hurwitz 222, Tennyson 201). As he wanders the globe, the Wandering Jew remarkably appears without explanation at the sites of great historical events such as the sack of Rome, the crusades, and decisive Napoleonic battles; these appearances at great events suggest that the Jew may have supernatural powers that allow him to appear wherever he chooses (Tennyson 212). The Jew’s constant wandering is enhanced by his fear that Christians will learn his true identity, so he must continually move from place to place so he is not identified and thus mistreated. Because Christ is usually depicted as loving and forgiving, it is odd that a story would have circulated of his uttering such a terrible curse against the Wandering Jew for such a minor unkindness. Isaac-Edersheim offers the explanation that the Wandering Jew should not be understood as merely an individual sinner, but as a force in opposition to Christ, a type of superhuman figure who must be defeated (190, 198). 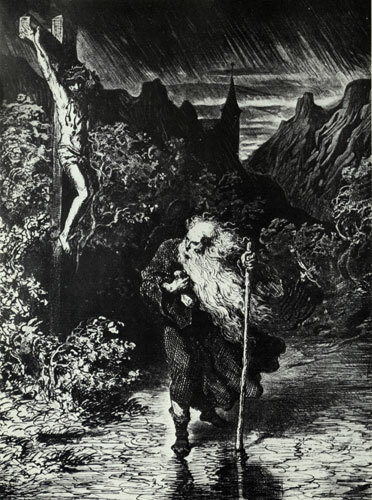 While numerous psychological and historical explanations have been offered for the Wandering Jew legend, the Gothic novelists chose to represent him as a transgressor, and therefore, a force in opposition to Christ. The Wandering Jew is appealing to readers because everyone has a bit of wanderlust in him or her, and the Jew represented the common human fear of becoming an outcast (Isaac-Edersheim 197). The Gothic uses wandering as a metaphor for guilt and despair, and the Wandering Jew became the perfect vehicle for depicting such emotions. The Wandering Jew feels great guilt over his transgression, a guilt that becomes nearly unbearable because of his extended life. The Wandering Jew frequently yearns to escape from his punishment by committing suicide, yet he is unable to accomplish such a deed because he cannot die until Christ’s return: if the Jew tries to drown himself, the water pulls away refusing him entrance; if he tries to jump into a volcano, he is spit out alive, and in battle, no man is able to harm him, so his prolonged life becomes only prolonged misery. Isaac-Edersheim remarks that the Jew’s prolonged life symbolizes the human repressed desire not to die (196), but ultimately, this desire is rejected when life-extension is fully considered. Marie Roberts observes that the legend becomes a lesson upon man’s moral responsibility to reconcile himself to death, for not only is death inevitable, but the reverse would be far worse (Gothic 208). The Wandering Jew was only a minor figure in British literature before his adaptation by Gothic novelists. The first recorded reference in England of the Wandering Jew was in 1228 in the chronicle of the monastery of St. Alban’s, entitled Flowers of History by Roger of Wendover (Roberts, Gothic 74). Among the other medieval depictions of him, the most notable appears in Geoffrey Chaucer’s “Pardoner’s Tale” where an old man must wander the earth until he can find someone willing to exchange youth for his old age. The Wandering Jew’s popularity in literature increased during the seventeenth century. He is given the name of Ahasuerus in an anonymous German pamphlet of 1602 entitled Kurtze Beschreibung und Erzehlung von einem juden mit Namen Ahasverus (Roberts, Gothic 75); Ahasuerus would become the favored name for the Jew, although Matthew Paris also wrote a story in the seventeenth century, naming the Jew Cartaphilus (Tennyson 202). During the seventeenth century, the Wandering Jew also becomes credited with healing powers attributed to the Rosicrucians, as stated in Peck’s History of Stamford and Aubrey’s Miscellanies (Roberts, Gothic 74). Later, the legend of the Wandering Jew and the Rosicrucians would become blended together in Gothic literature. Other notable treatments of the Wandering Jew prior to the Gothic novel occur in late eighteenth century German literature. Goethe wrote a fragmented tale either simultaneously with or directly after his famous The Sorrows of Young Werther (1774), but it was not published until 1836 (George Anderson 168-73). Christian Schubart also wrote a fragment published in 1783 called Der Ewige Jude (Roberts, Gothic 78). Finally, Reichard’s Der Ewige Jude (1785) ambitiously chronicled the Jew’s entire wanderings throughout history (Roberts, Gothic 75). None of these early treatments, however, popularized the Jew or were of significant influence to the Gothic tradition. Matthew Lewis’ The Monk (1796) is primarily responsible for the Wandering Jew becoming an important Gothic figure. 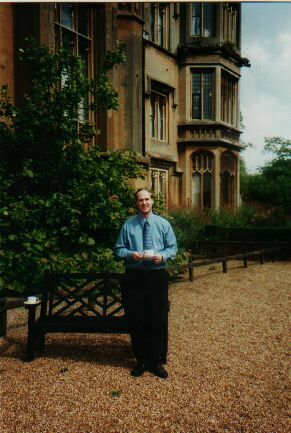 Tyler at Knebworth House in 2000. As has been told thousands of times, Frankenstein was first conceived during a holiday in 1816 when Lord Byron, his physician John Polidori, Mary Shelley, and Percy Shelley all gathered together to tell ghost stories. From that evening Polidori’s The Vampyre was conceived—the first vampire story in English—and Mary Shelley’s Frankenstein. Consequently, Byron was present at the origins of Frankenstein. What I wouldn’t give to have Byron’s copy of Frankenstein, but alas, I don’t have 400,000 pounds. But the auction sale reminded me of one of my favorite literary experiences I had in the summer of 2000 when I attended the first Edward Bulwer-Lytton conference at the University of London in England. There I presented a paper about the influences of Bulwer-Lytton’s novel Zanoni (1842) on Charles Dickens’ novel A Tale of Two Cities (1859), a paper that later formed the basis for a chapter in my new book The Gothic Wanderer. But for me, the highlight of the conference was when Lord Cobbold, descendant of Bulwer-Lytton, had us all for dinner and a play at Knebworth House, the fabulous Victorian Gothic home built by Bulwer-Lytton. Bulwer-Lytton fancied himself as a Lord Byron type, having come of age while Byron’s poetry was all the rage. Bulwer-Lytton was born in 1803 while Lord Byron died in 1824. Not far from Knebworth House was the home of Lady Caroline Lamb, Lord Byron’s former mistress, who had committed adultery with him, despite her marriage to Viscount Melbourne, later Prime Minister of England. By the time Bulwer-Lytton knew Lamb, she was middle-aged, but he was a young man who fancied she might take an interest in him, although eighteen years his senior. 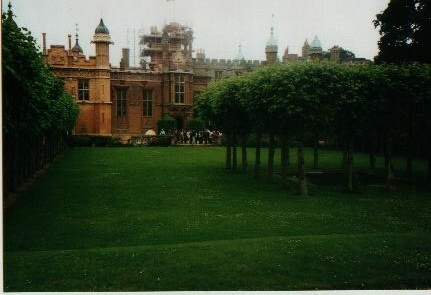 You can well imagine how exciting it was for me to visit Knebworth House and especially when Lord Cobbold gave us a tour, showed us Lord Byron’s ruler, and then unlocked the glass cabinet, and unbelievably, passed around the copy of Glenarvonthat Lady Caroline Lamb had given to Edward Bulwer-Lytton! For just a moment, I got to hold it in my hands and feel connected to those far away great Gothic authors of the past. Now if I only had 400,000 pounds. 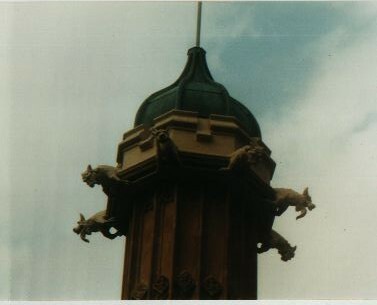 Gargoyles on one of Knebworth House’s many towers. In my new book The Gothic Wanderer, I discuss how in the early twentieth century, the Gothic Wanderer figure was transformed into a superhero figure, citing Superman and Batman as examples. However, the movie My Super Ex-Girlfriend, starring Uma Thurman in the title role, takes the superhero a step back to its Gothic Wanderer origins. Most Gothic Wanderers are guilty of being transgressors, holding dark secrets they must hide from others. The superhero figure is much the same, except rather than guilt, the superhero must hide his identity from the world. And in My Super Ex-Girlfriend, superheroine G-Girl, played by Thurman, is no different, until she falls in love. G-Girl, disguised as ordinary girl Jenny, begins dating Luke Wilson’s character, Matt, after he hits on her, she rejects him, but then he tries to stop a purse thief. While still keeping her identity a secret, she tells him that she always has to help others, but he was the first person who ever helped her, so he is her hero. He doesn’t yet understand the full implications of this statement, but as the film goes on and G-Girl reveals her identity, she also reveals just how lonely her life has been. Soon she is jealous of Matt’s attractive coworker, Hannah. When Matt suggests Hannah and her boyfriend join him and Jenny (G-Girl’s name for the world to know), and G-Girl instead must rush off to save the world from a missile gone astray, only to return to find Matt and Hannah hugging, her full sense of loneliness is written all over her face. The movie goes from that point into a scary picture of a neurotic G-Girl when Matt tries to suggest they break up and G-Girl becomes the crazy ex-girlfriend, accusing him of sleeping with Hannah. Soon, Matt finds himself in his own Gothic nightmare (although hilarious to the viewer) as G-Girl makes his life a living hell–even his nightmares based on fear are scary enough. G-Girl has, like most Gothic wanderers, achieved forbidden power, or at least unnatural and supernatural power, in this case after being exposed to meteor radiation, which allows her to fly, gives her superhuman strength, and heat vision. These abilities have separated her from humankind. In the film, Matt and his friend, Vaughn (played by Rainn Wilson) discuss what the G in G-Girl stands for, but I don’t remember an answer ever being given – could the G really stand for “Gothic”? Well, despite the Gothic elements, superheroes tend to have happy endings, and this movie is a comedy. There are some interesting twists, including an ex-boyfriend of G-Girl’s who has become her nemesis as the film’s chief villain. It’s an entertaining film, good for some laughs, but it also speaks to issues of loneliness for those who are different in society. How many viewers, I wonder, realize that G-Girl is a literary grandchild of Gothic wanderer outcasts?